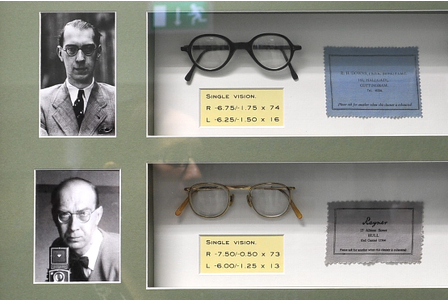 To find a pair of Philip Larkin’s glasses – and some of his poetry – on display in an NHS hospital might in many ways seem to be a somewhat strange meeting of cultures. Yet in 2012, the Hull and East Yorkshire Eye Hospital made this very decision, exhibiting Larkin’s striking NHS specs in an exhibition that also included his poem ‘Long Sight in Age’; the MP for Hull West, Alan Johnson, in fact summed up the strange paradox of this decision by remarking; “I wouldn’t say Philip Larkin himself would be quite so chuffed with being associated with the NHS – he was a hypochondriac…But this display has married two subjects I am very passionate about – the NHS and Philip Larkin”(Hull Daily Mail, October 8, 2012). Despite being referred to as a ‘welfare state’ poet, the NHS and the poetry of Philip Larkin would in fact appear to be uneasy bedfellows and Larkin, as such, might seem to offer an unusual case study from which to think about the cultural representation of the NHS. And yet Larkin’s poem ‘The Building’ offers something conspicuously revealing about our relationship with this cherished institution. ‘The Building’ poses some key questions for readers when thinking about the cultural history of the NHS. What, if anything, can a poem such as this tell us about the relationship between the NHS, as an institution embodying egalitarian ideals, and the ‘reality’ of the NHS in everyday life? And is there a space for critique in and amongst the literature that valorizes this most beloved of British institutions? If the NHS is, as Nigel Lawson, suggested, ‘the closest thing the English have to a national religion’, then where does the potential for critique stand in regards to our National Health Service, and is it possible to engage in such critique without undermining the establishment altogether? To begin with, though this poem clearly speaks of a hospital, it is perhaps unclear as to which precise building it is that the poem speaks. While common knowledge places this poem as speaking of Hull Royal Infirmary, Archie Burnett – editor of the Complete Poems – argues that ‘The Building’ was not inspired by Hull Royal Infirmary at all but by Kingston-Upon-Hull general hospital (formerly Sculcoates Union Workhouse). Whether Burnett’s claim is borne out by the poem itself, however, can certainly be put into question, as we will see. But what is striking about this poem is the way in which the building of which the poem speaks is given as indicative of the conditions of the Welfare State, and establishes the NHS as emblematic of a civilization in decline. The poem itself captures a sense of castigation towards the modern world; the NHS is presented through the image of a modern hospital building, yet its representation of the levelling effects of the NHS warrants closer attention. From the outset the hospital is described as a beacon – ‘higher than the handsomest hotel…lucent comb’ rising from the ribcage of the city (‘All round it close-ribbed streets rise and fall/Like a great sigh out of the last century’), in a way that suggests the breathing of urban life, where the architecture of the hospital takes on a monolithic, yet almost surprisingly organic presence (and this description would certainly align the building more with the architecture of Hull Royal Infirmary). For if the streets ‘breathe and sigh’ around the building, then as readers we are potentially faced with a living entity; a notion borne out by the mention of ‘creepers’ that grow inside the hall, accompanied by a ‘frightening smell’, and this growth is further depicted within the lines ‘see how many floors it needs, how tall /It’s grown by now’. Yet over and against this imagery the poem is punctuated with a sense of repetition and rhythm, which imparts a tone of machinery and undercuts the organic (and uncontrollable) growth of the building; the constant ‘drawing up’ of the ambulances; the turning of the magazines; the nurse that appears every few minutes; the refitting of cups back to saucers – the narrators remark that ‘each gets up and goes at last’. It may well be, therefore, that as a genre most suited to the exploration of metaphor, Larkin’s poem identifies some crucial meanings associated with the NHS, albeit from a seemingly disparaging standpoint. In ‘The Building’, Larkin’s NHS is both an organism that grows beyond any manageable capacity, while also functioning as a somewhat less well-oiled machine. This is also evident in the description of the details of the hospital’s environment, where the potentially ‘aseptic’ tone of the poem is compromised by the description of ‘scruffy’ porters and ‘ripped mags’, in a way that suggests the impoverished reality of life inside an emblematic NHS institution. This is emphasized by the comparison of the rows of visitors to travelers on a local bus with ‘half-filled shopping bags’. Again the reference to the bags as half-empty suggests deprivation, but this sense of poverty and sickness extends beyond the patients waiting to be seen to the hospital itself; ‘see […] how much money goes / in trying to correct it’. Here we glimpse a vision of the potential political import of this poem – written in 1972 – which describes the hospital and its staff as in need of improvement, but money here having little effect on the ever-spiraling growth of this establishment, where even patients are reduced to the vulgarity of monetary value in the lines; ‘women, men; / Old, young; crude facets of the only coin / This place accepts’. However, even this reference to monetary value is somewhat more ambiguous than may first be assumed. The reference to the lack of coinage may well signal the free service that the NHS represents, but in this context, does that mean that, in the narrator’s terms, in exchange for money this universal health care service devours instead bodies and, perhaps even, identity? Or is this an acknowledgement that in this building, and for the NHS generally, people are the only motivating force behind its service, where money has no value? Perhaps. And yet the list of patients collected together signifies a levelling potential that speaks not only of the inevitability of death, with which the poem is ultimately concerned, but also of a possible erasure of individuality through the ideology of the NHS – if (and this needs further consideration) the hospital can be taken as a metonymy for the National Health Service. For it appears that while the hospital has been imparted with some kind of living presence, it is clear that something has happened to the status of the individual within its walls, due to this levelling environment. If this is a poem reflecting on the NHS, then commonality is offered up as a precarious gift. The lines ‘To realise / This new thing held in common makes them quiet’ has the potential to resonate beyond the death that the walls try but ultimately fail to hold in abeyance, out to the silencing effects of the health service itself. This negative outlook is reiterated in the sentiment of the lines ‘See the time, / Half-past eleven on a working day, / And these picked out of it; see, as they climb / To their appointed levels’. Here there appears almost a conflation of the climbing of the hospital stairs with a notion of social mobility, but that all reach their ‘appointed levels’ suggests an ambivalence towards the possibility of a truly egalitarian system, while the noting of the absence from work (which directly follows the line regarding the hospital consuming public funds) again bears unsavoury undertones for the depiction of the effects and inner workings of the NHS (and the fact that the patients sit ‘restless and resigned’ would hold out such a reading). Regardless of whether we align with Larkin’s particular politics, it is clear that by exploring the value of the NHS through a poem such as ‘The Building’ an ongoing part of the cultural history of the NHS can be explored, where there is the holding of space for critique and self-critique. But it also demonstrates that there is surely a crucial and fundamental distinction between such criticism that seeks to single-handedly undermine the (ideological) foundations of the institution, and that which partakes in a very British tradition of self-deprecation and satire, while nonetheless seeking to defend the NHS from a complete dismantling. In the poem considered here, the ideals of the NHS are shown to sit in tandem with more complex explorations of its everyday operation, but this may have become, in its own way, part of the cultural history of the National Health Service. This is not simply to speak of a British culture of a community ethos established through the joy of complaint, but to merely pay heed to the complex and nuanced ways in which the NHS is represented through literary culture. The NHS clearly holds a ‘special place’ within the history of the Welfare State, and perhaps precisely because of this special place the question remains as to whether it is indeed possible to produce any literature of the NHS ‘on grounds curiously neutral’, at least without an implicit betrayal of the community identity (across both workforce and service user) established by this most celebrated of British institutions. I agree! And there will be – watch this space…..!